In addition to sunscreen, sun protection clothing is a way you can make sure you block most of the sun's rays while outdoors. And since camping is an outdoor activity, you can throw on a sun protection shirt and a sun protection hat, and feel comfortable that your skin will have a deep level of sun protection while you spend your days having fun. Sun protection clothing differs from regular clothing in that the clothes have a tight knit which blocks the sun's rays from passing through to your skin. This type of clothing has long been available in Australia, but is now becoming more popular in the United States as well. The UPF (ultraviolet protection factor) rating is to clothing, what the SPF is to sunscreen. Today many outdoor companies are making clothes that come with a UPF rating, and today, the United States has the most strigent UV-protective clothing standards in the world. Clothing must have a minimum UPF rating of 15 in order to be labeled as sun protection clothing. A UPF rating of 50 is considered the ultimate protection. According to the FTC, a garment labeled with a UPF of 50+ does not offer substantially more sun protection than one labeled with a UPF of 50. UPF 15-24 is considered GOOD sun protection, blocking 93.3 - 95.9% of the UV rays. UPF 25-39 is considered VERY GOOD sun protection, blocking 96.0 - 97.4% of the UV rays. UPF 40-50+ is considered EXCELLENT sun protection, blocking 97.5 or more of the UV rays. Who Benefits From Sun Protection Clothing? While not everyone needs to invest in UPF clothing, if you are fair-skinned, sensitive to the sun, sunscreen products, or spend a lot of time outdoors, you will benefit from the extra protection this type of fabric can give your skin. Infants and children also benefit from the extra protection, especially since dermatology experts estimate that a very high percentage of our lifetime sun exposure will occur before the age of 18. Starting from the top down, a sun protection hat is an important part of your sun protective clothing wardrobe. A sun protection hat should have a wide brim to cover your face, ears, and neck, which are probably the most sun-exposed parts of your body...being exposed to the sun on a daily basis whether you are camping or not! Next is the sun protection shirt. 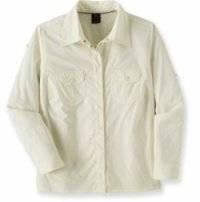 You can get a sun protection shirt in a short-sleeved or long-sleeved version. Of course, you gain a lot more benefit from having your arms covered than exposed. Sun protection swimwear provides you with sun protection to the parts of your body that are not covered with sunscreen when you are camping and participating in water activities. These days, the dense fabric that blocks out the sun's skin damaging UV rays is also weaved into a sun protection umbrella! Perfect for sitting under when you are at the campsite, especially one that does not have a lot of shaded area. A larger umbrella or cabana-type structure can protect several people and is perfect for infant's or children's sun protection. Turn Your Clothing Into Sun Protection Clothing! Today you can buy a product called Rit Sun Guard Laundry Treatment UV Protectant , which, when put into your washing machine with a load of laundry, turns those clothes into sun protection clothing. Adding Sungard to a load of laundry will increase the UPF of those clothes by 6 times, providing a UPF factor to your clothing of at least 30. The Skin Cancer Foundation has given Sunguard its seal of approval for aiding in the prevention of sun-damaged skin. One treatment with Sunguard and a garment will be considered sun protective clothing for up to 20 washing. This protection is the same whether the fabric is wet or dry. Sunguard can be considered a relatively inexpensive method of making sure your clothing protects you from exposure to the sun's rays. How sunscreen insect repellent needs special attention when you use it. Learn about SPF and How sunscreen facts.